"That cat," I thought, "has gone too far!" The feline in question, a large gray male, shot me a scornful glance from his position in the middle of the dining table. Then he returned to his personal washing. My friend, catching my questioning stare, looked fondly at the stray she'd rescued six months before and explained. "He prefers to sit on the table while he washes. If I shoo him off he'll scratch me. I do wipe the table when he's done." And, so she did, with the same cloth used to wash the dinner dishes. I watched this woman, holder of university degrees, sophisticated traveller, skilled organizer of government projects, abase herself before a speechless animal. I thought of other hard-nosed, practical Canadians who turn to mush for Fluffy, Orpheus or Max. And, I realized something's going on here. Cats are gradually controlling Canadians. You've probably noticed this yourself. Or, maybe not. If you're under their spell, humouring a cat's every whim seems like good sense. How do you recognize if the cat's taken charge? Do your cat-owning buddies spend their nights as door-persons to those cats, up several times to let them in or out? Do they tolerate behaviour which, if carried out between humans, would have people muttering "Co-dependant!" and recommending counselling? Cats, of course, are consummate actors. 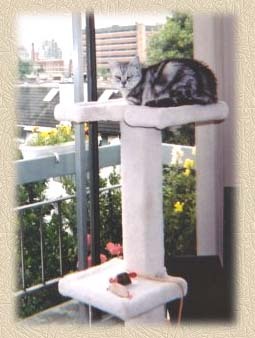 None is better than Maximilian, a Vancouver high-rise cat. Like most cats Max pretends to be fastidious about his food. He eats one brand's tuna and whitefish. Nothing else. Not ever. Once, and once only, his person tried to change him. She provided other food. For four days Max refused to eat. When his full food dish was pointed out to him, Max, with a flair that would win him a standing ovation at Stratford, flung himself on his back, all paws sticking straight skyward, giving his impression of a dying cat. On the fifth day his person surrendered. Now Max, given an open balcony door and an unsuspecting bird, will grab the bird and eat it. The best fed cats keep up their ability to hunt. It gives them independence and threatens humans. Cats, masters of psychology, bluff. "Feed me Cat's Delight or I'll just ignore you and go fend for myself." They play skillfully on our fears of being abandoned, discarded in favour of a small sparrow or a tattered squirrel. It takes more than special food to keep today's cats happy. Cat services are on the increase. Dental hygienists and therapists have been added to veterinarians. Recently I heard of a 'baby shower' given by family and friends for a childless couple who'd adopted a kitten. What happened to old-fashioned cats? Just one human generation ago there were two kinds of cats, house cats and barn cats. Barn cats, as you would expect, bedded in the hay loft, kept down the farm-yard mice, and, as a treat, received the occasional pat and squirt of milk. Their lives were hard but wild and free. A barn cat might even be promoted to house cat. House cats, though more pampered, were still expected to earn their keep. Mice in the oatmeal? Squirrels in the attic? They were the cat's responsibility. Failure to perform led to stern rebuke. Cats weren't 'companion animals', they were necessary, contributing members of the farm and household. The day of the good old cat is gone. 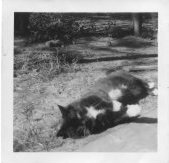 Our 1960s family cat, Peter Diefenbaker Whiskers, was an aristocratic Persian in formal fur with the lofty attitude of an old Tory graduate of Osgoode Hall. Whatever his blue-blood pretensions, Peter was a working cat. Cat food? Hah! He was expected to hunt for his supper. He drew the line at chasing weasels in the hen house. but we understood. Weasels are fierce and we liked our cat. Otherwise, handsome or not, he was an industrious partner in the family. Contrast that with the attitude of a newly acquired barn cat I know which was recently taken into posh city surroundings. One day, a ragged, nameless kitten, huddled with a mob of others; the next, a pampered urban princess. Was she grateful? No, indeed. Two days after arrival she had terrorized the Dalmatian, and, in a week, totally dominated the household, including the two senior cats. What's going on here? I'll leave explanations of dominance and submissiveness in our species to someone with training in analysis. Let's go back to the beginning of this strange relationship. The contract between humans and felines, says Dr. Stanley Coren, goes back about 7,000 years ago, when cats first became domesticated. Dogs were hanging about the cave much earlier, up to 14,000 years ago. But, there was a lot for a dog to do in a hunting/gathering society. Chasing and holding game, guarding the group, barking alarm, frightening away attackers. Cats, however, served no useful purpose to people until the agricultural revolution. Surplus grain stored in granaries naturally attracted rats and mice. Following the rodents came the cats, smacking their lips at the concentration of easily available food. People soon noticed that these furry creatures, being nocturnal, were far superior to humans at catching mice and rats. Cats assumed humans were somehow connected to the new source of food. Humans decided cats were valuable allies. From those Mesopotamian granaries came our domestic cats. For 7,000 years both parties benefited. What's changed? Maybe it began with round, plastic wrapped hay bales. How's a mother cat to make a bed for her young in a pile of plastic? Or, it might have been milking machines. Oh, sure, there are still cats on dairy farms, but, can you really compare the friendly squirt of milk from the farmers's hand with a dish full out of an impersonal machine? There's more secure and sanitary storage of grain, discouraging rodents and giving cats less to do. Moreover, agriculture seems to be dwindling, urbanization increasing. Cats could see the future; either find a new reason for humans to keep them around, or go back to the wild, what's left of it, prowling the dangerous night for food and shelter. What else could they do? Govel and flatter humans? No, that's the dog's gimmick, and, after 14,000 years, he's good at it. Fortunately, a niche opened. Human lives changed. This era with its small families, childless couples, divorced singles and apartment living gave cats a second chance. But, there may be more to this than cats working out a new job description in the post-modern world. It hasn't been all mice and milk these past 7,000 years. They've had great swings in fortune. They were worshipped as gods in ancient Egypt and burned as devilish familiars in medieval Europe. Was some feline history passed down parent to kitten? Are we seeing the longing to return to one's roots mingled with the determination of the victim's rights movement for restitution? Are those fancy 4-tier scratching posts today's equivalent of Bast's throne? Cats were deities along the Nile. Will they be content with nothing less on the banks of the Fraser? What of the future? Are cats plotting to replace dogs in human affection? If so, there will be resistance. Grumpy dog fanciers who think of cats as sneaky and dogs as honest and trustworthy are unlikely to desert their adoring canine companions for the 'kiss my whiskers' arrogance of the cat. is more dexterous with its paws. Some even have seven toes on each foot. Soon they may develop the opposable thumb. Then, the remote, the can-opener and the computer mouse are theirs. We'd best be on guard. Is there any option which will stem the tide of feline power? Winston Churchill, that sagacious British statesman, remarked, "Dogs look up to you. Cats look down on you. But pigs treat you as an equal. " Are pigs the pets of the future? In socialist communes, perhaps. In our hierarchical, uncertain, society, I'm betting the tuna on cats.